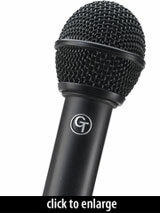 The GT Convertible was a stage condenser microphone with a removable ball mesh grille. It was intended to be used either as an instrument mic, with ball grill removed, or as a handheld vocal microphone with the grille installed. The circuit was transformerless, and was based on the popular Schoeps design. The capsule had a hypercardioid polar pattern, to aid with rejection and feedback issues in a stage setting. This capsule, unlike in the GT-44, was not removable. It was mounted on rubber shockmount posts to reduce mechanical noise. The mic was introduced at Winter NAMM 2005, at an introductory price of $149. The Groove Tubes Convertible is also known as: GT Convertible.